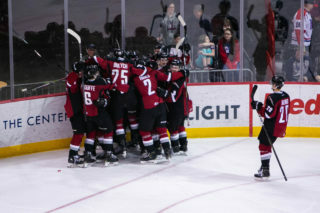 The Vancouver Giants (28-12-2-2) are returning home with a 13-point lead in the B.C. Division standings thanks to their latest road triumph. 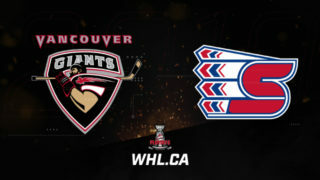 Friday night in Spokane, WA the Vancouver Giants earned a 6-4 come-from-behind victory over the Spokane Chiefs (24-14-2-2), extending their winning streak to five games. 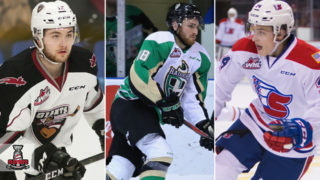 Jared Dmytriw scored twice for the Giants while his linemates Dawson Holt (three assists) and Owen Hardy (two assists) combined for five points. The forward tandem of Davis Koch and Tristen Nielsen each added a goal and an assist for the Giants who trailed Friday’s game 3-0 9:08 into the period. Luc Smith had two goals in response for the Chiefs who lost for the first time in five games. SPO – Luc Smith (19) opened the scoring for Spokane just 1:28 into the first period on a power play when he one-timed a Riley Woods feed past Giants starter David Tendeck beside the net. SPO – Luc Smith (20) parked himself in front of David Tendeck and deflected home his second of the night off a Jaret Anderson-Dolan shot from the right-wing circle. Smith’s 20th came via the power play. SPO – At 9:08 of the first, Nolan Reid (8) extended the Chiefs lead to 3-0 off a shot from the right-wing point. Reid’s goal also came courtesy of the power play which finished the game three-for-three for Spokane. VAN – Tristen Nielsen (7) got the Giants on the board at 18:33 when he slid a backhand shot by the blocker of Chiefs starter Bailey Brkin. VAN – Giants captain Jared Dmytriw (9) notched his first of two goals on the night off an odd-man rush at 1:57. Dawson Holt and Dallas Hines earned assists. VAN – At 6:11 of the second, Seth Bafaro (5) scored his first goal of the Giant off a slick back-door feed from Dawson Holt, tying the game 3-3. VAN – Less than two minutes later, Jared Dmytriw (10) snuck into the slot and wired his 10th of the season past Bailey Brkin at 8:40 to give the Giants a 4-3 lead. SPO – Toronto Maple Leafs prospect Filip Kral (5) got the Chiefs back even at 4:12 when he snapped a shot past David Tendeck’s glove. VAN – Off a two-on-one rush, Davis Koch (15) one-timed a Tristen Nielsen feed past a diving Bailey Brkin at the 11:11 mark. 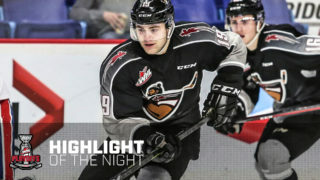 VAN – Rookie Justin Sourdif (11) ended all hopes of a Spokane comeback when he scored into an empty net with 39 seconds remaining in the third. Next Giants Game: Saturday night at home against the Moose Jaw Warriors at 7 PM. 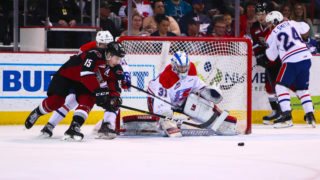 The Vancouver Giants have now defeated the Spokane Chiefs in three straight meetings dating back to March, 2018. It was their first regulation victory against Spokane since September, 2012. The Giants improved their road record to 11-7-1-0 and have won three straight games on the road dating back to January 6th in Cranbrook. With a goal and an assist in Spokane, Davis Koch extended his point streak to five games. During that span, he’s scored four goals and added nine assists for 13 points. He’s scored goals in four straight and has recorded five consecutive multi-point games.